Courtesy of an email today from GameStop, zombies will be returning in Call of Duty: Advanced Warfare's downloadable content packs. Update: Activision has clarified that the $50 seasons pass will not be required to play Sledgehammer's version of zombie mode. Zombies may or may not make an appearance in the release version of Advanced Warfare, due out just about everywhere tonight at midnight, but according to an email sent out this afternoon by GameStop, they'll definitely make an appearance in the subsequent four packs of downloadable content included in the game's season's pass. 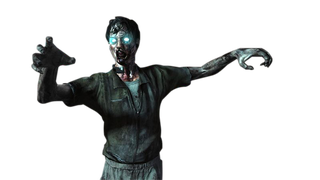 It's still up in the air if the zombies (ZOBMIES) will be returning as a standalone game mode with running story, or if they'll be piggybacking on the game's Exo Survival co-op mode. I was really hoping for robots, dammit. At least there's still hope for Spacey zombies. Update: GameStop's wording seems to have made folks think the new zombie mode would only be available with the Advanced Warfare season pass. Activision has clarified with Kotaku that the zombies will be available in DLC packages whether purchased as part of the season pass or standalone.